Montecasino’s Money Talks promotion has seen yet another batch of winners this month. The Tsogo Sun-owned casino is turning its cardholders into weekly winners with the promotion. Just recently, three Gauteng winners took home a substantial R150 000. The promotion has a whopping R2.2 million up for grabs over ten weeks. 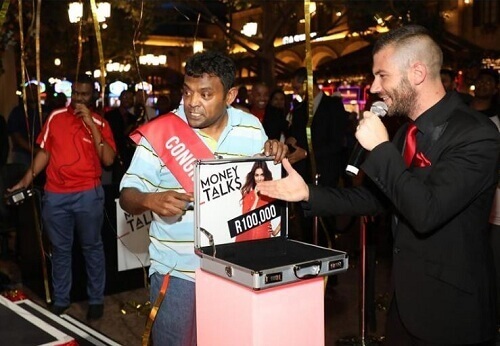 Three locals took home a share of R150 000 on Montecasino’s Money Talks promotion. Sathanandhan Govindsamy from Krugersdorp won the top cash prize of R100 000, followed by two Roodepoort residents, Kenneth Morgan who won R30 000 and Anna Lukoto with R20 000. The three are the second batch to win the South African casino’s promotion. The first three winners were drawn in October 2017, also taking home a total of R150 000. The winners were Kizya Nsamba from Midrand, Mmama Mogaladi from Centurion and Ian Woodmun from Roodepoort. Montecasino launched its Money Talks promotion on 30 September 2017. In order to participate, one needs to hold a Montecasino’ Black Rewards card. The next step is to use the card to play slot machines or table games at the casino. The more points you earn, the more entries you get into the draw. Cardholders get one entry into the draw for 1 000 points. The promotion has cash draws every week and also every first and last Saturday of the month. For each draw, three winners are selected. The Montecasino Money Talks competition is set to run until 14 December. Montecasino has various exciting promotions running. Another one of them is Fortune 500. Montecasino Rewards cardholders stand a chance to win R1 million in cash and a Mercedes E200 Coupe by 9 December 2017 on Fortune 500. All you need to do is play slots and table games. Sounds like an exciting way to start your festive season right?! We wish all participants the best.